This building, and the nearby Wigwam Restaurant, are striking examples of a rustic architectural style that shaped the character of Wasagaming during its formative years. Rustic buildings, common to Canada’s national parks in the 1930s, were constructed with peeled logs and fieldstone, to create picturesque additions to resort communities. An abundance of timber and skilled local craftsmen produced Wasagaming’s charming rustic log buildings. The Park Theatre was built in 1936–37 of saddle-notched logs to designs prepared by the National Parks’ Architectural Division. 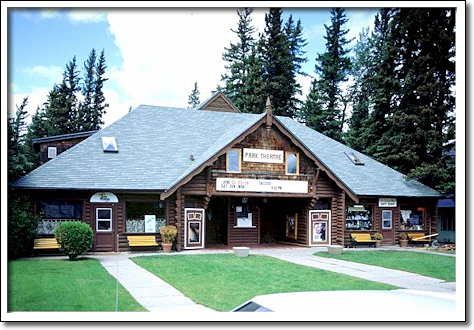 It was the only log cinema built in a national park, if not in all of Canada. The theatre auditorium features exposed log beams and rafters with decorative wrought ironwork.